Since Halloween is finally here, it is time for you to finalize your party menu. These five themed appetizers will trick your guests and maintain a festive atmosphere. Moreover, these party foods are easy crowd pleasers that everyone will love. Mummy halloweenies are a two ingredient appetizer that will please kids and adults alike. Wrap up your favorite hot dog or sausage in prepared dough and bake - it's that simple. I like to sprinkle a little cheese on the inside for an extra layer of flavor. Eyeball pinwheels are a fun way to present wraps to party guests. Flour tortillas are spread with flavored cream cheese and layered with cheese and and ham. You could also use turkey or roast beef. An olive is set in the middle and dotted with a piece of pimento pepper. If you have a sweet tooth, these candy corn kebabs are a healthy alternative to the classic Halloween sweet. Pineapple, papaya and banana are skewered onto toothpicks and served with a passion fruit sauce that is sweetened with honey. Deviled eggs are always a crowd pleaser and this recipe is no different. 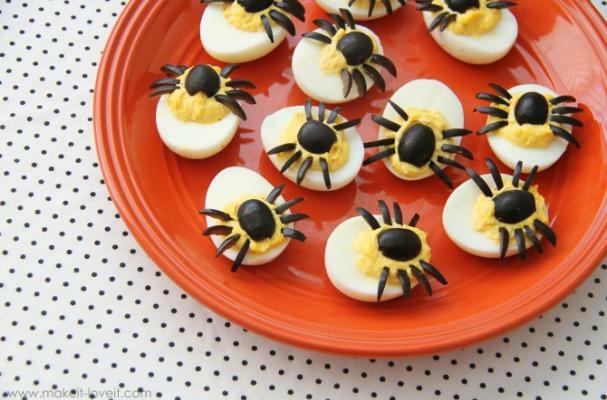 Olive spiders crawl across the top of the hard boiled eggs, making eaters think twice before taking a bite. The salty olives pairs nicely with the piquant mustard and paprika flavored yolk filling. Turn the standard crudite platter into something fun and festive for Halloween. The baby carrot sticks are arranged in the shape of a pumpkin with broccoli florets forming the stem. The jack o'lantern eyes and nose are created using squared and triangle shaped dishes filled with dip. Half moons cuts of cucumber or zucchini are the menacing mouth.